A new study from Wake Forest University researchers, published in the New England Journal of Medicine, says that the sooner people can get their weight down and start exercising the better their mobility can be, with those who are overweight and have diabetes. The study says that even a one percent drop in body weight cuts the risk of mobility problems by more than seven percent, and the same increase in fitness level lowered mobility risks by one to two percent. MyNetDiary not only helps people lose weight, eat better, and become more active, but it also tracks all information related to diabetes - BG readings, carb intake, time, exercise, and insulin (and/or diabetes medications), and helps learning about their relationships. MyNetDiary also provides Community Forum to share experiences and learn from others, articles and blogs about diabetes, and support of our active Facebook Community. Patients can track carbs with a powerful and accurate food database. It is very rare to have a BG tracker that can do both carb and BG/insulin tracking. Typical diabetes trackers have quite rudimentary food trackers, and people are either struggling to use them or forced to use other systems to track foods. MyNetDiary provides state-of-the-art food tracking, with a huge 716,000 foods database, quick and easy food entry searching as you type, recipes, favorites, and barcode scanning in the mobile app. Diabetes Tracker allows the patients to see the relationship between their BG readings, carb intake, time, exercise, and insulin (and/or diabetes medications) all with a consolidated, colorful Diabetes Overview report. This is a powerful learning tool that is literally right at their fingertips, both online and in the mobile app. The information is grouped by day periods and displayed chronologically. You can view daily and weekly overview reports. MyNetDiary also includes many other tools, encouraging behavior changes: daily and weekly analysis, daily and weekly food reports and charts, Food Score helping compare foods and make better food choices. MyNetDiary users can join the Community Forum and participate in discussion, ask questions, learn and share their experiences. The forum is supported by Katherine Isacks, MPS, RDN, CDE. 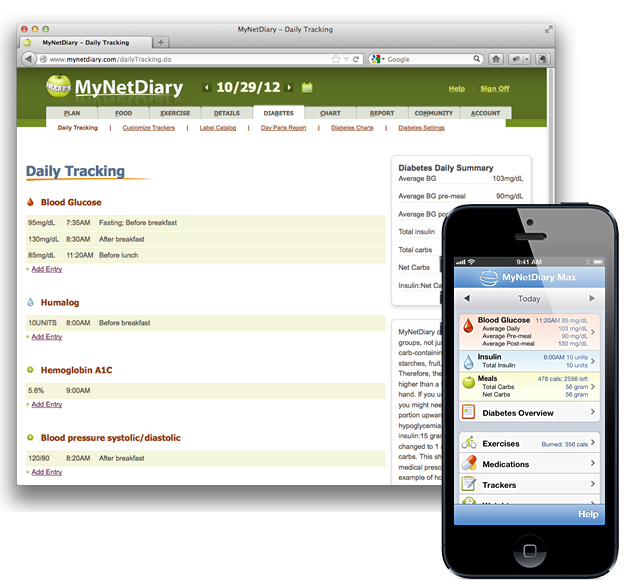 MyNetDiary provides equally easy and comprehensive online and mobile tracking tools. They could be used independently, or together, with mobile app syncing to the online website. Learn more about mobile app features. MyNetDiary is built on a solid, scientific foundation, following guidelines, recommendations, and equations of the Academy of Nutrition and Dietetics, American Diabetes Association, the American Heart Association, and United States Department of Agriculture (USDA). You can review and learn MyNetDiary's calculations and equations used, as well as sources of information in the MyNetDiary HealthCare Professional Guide. If you are interested in working with your patients or clients more closely, MyNetDiary supports secure information sharing between members. You and your clients can setup information sharing between you using MyNetDiary Community tools. Access daily food and exercise logs. 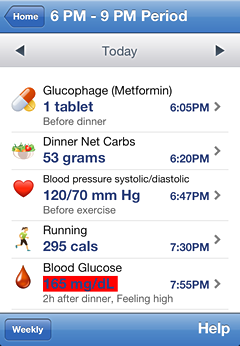 Access BG, insulin, and medication logs. See their graphical charts and reports. Both one-to-one and group communications are supported. Provide your feedback and recommendations using private or group-wide messages. MyNetDiary Inc., founded in 2005 is privately held and profitable since 2009. MyNetDiary provides comprehensive, dependable service, loved by its users, who appreciate high quality and affordable costs of MyNetDiary. The Diabetes Tracking project was started within MyNetDiary in mid-2011. In 2012, after comprehensive testing period and pilot programs, MyNetDiary made its diabetes tracking tools available for public access. The diabetes tracking service is built on the solid, proven foundation of the diet service, adding blood glucose, insulin, medication, and custom trackers, as well as special charts and reports helping to get the whole picture of one's health, to learn and improve.